Even I wasn’t convinced of any of this, but I suddenly felt bad for owning a Tassimo, and even worse for not taking the time to understand where my coffee comes from and the potential impact it could have on the environment. Though convenient, the waste stacks up. 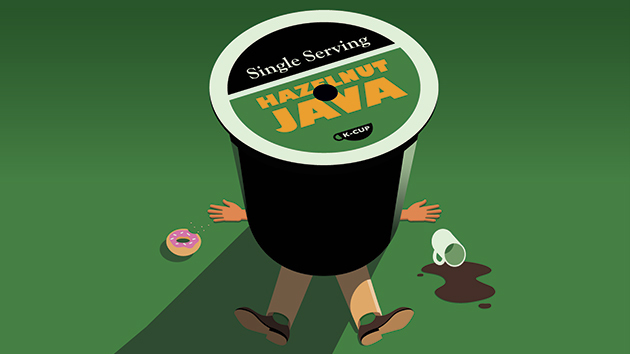 Between 2006 and 2011, the demand for disposable coffee pods rose by 523 per cent in the United States alone, according to an article by bizenergy. Considering that these pods cost a fortune—The New York Times calculated that the Folgers Black Silk Blend for Keurig is $10.69 for 12 pods containing eight grams of coffee each, which works out to be over $50 a pound. As it turns out, coffee pods are not recyclable meaning that people are either unaware of the impact or they simply prefer convenience at any price. If I had to guess I would say it’s the latter. I was a barista for three years and still make the choice to use coffee pods. In a world where time is a currency (and people seem more and more impatient), waiting 10 minutes while a pot of coffee brews, is absolute hell. People seem to always pay more for an instant commodity. However, choosing convenience doesn’t necessarily have to be at the cost of sustainability. If you absolutely have to use the coffee pods, there are some ways to do so in an environmentally friendly way. Kill the K-Cup, buy a reusable or compostable one instead. Keurig is one of the biggest companies in the coffee pod industry. 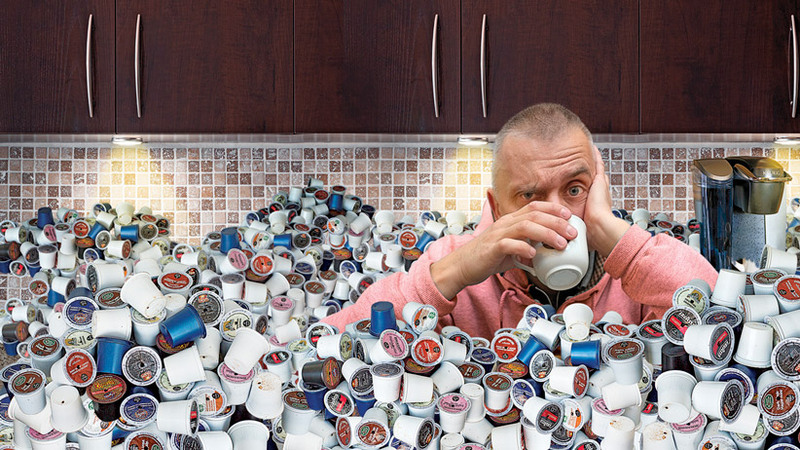 According to The Atlantic, last year K-Cups accounted for the majority of the company’s 4.7 billion revenue, Keurig producing enough unrecyclable K-cups to circle the earth at least 12 times (up from 10.5 times in 2013). However, there are some ways you can work around this. The My K-Cup reusable coffee filter is a three-piece metal filter that you can use with your own ground coffee in your Keurig brewer. Keurig has also created the ‘Grounds to Grow On’ program, which allows you to send in your K-Cups, where the components will be sorted, the grounds will become compost and the remaining parts will be used in an energy-from-waste process. Unfortunately, this program is not yet available in Canada. If you’re like me, and opted for a Tassimo over a Keurig, then you are already one step ahead. The Tassimo pods, called T-Discs, are in fact recyclable. The outer part of the disc can be incinerated for energy recovery and the inner part is 100 per cent recyclable. Tassimo has also partnered with TerraCycle, in order to make their product more sustainable. Like the ‘Grounds to Grow On’ program, you can sign up at TerraCycle, download a pre-paid postage label and ship your used T-Discs in a cardboard box. TerraCyle will recycle the discs into eco-friendly products such as watering cans, benches, cutting boards and plastic lumber. CrauseCo creators,Ken Crause and David Wicks, have created a compostable coffee pod that allows people to brew coffee quickly and conveniently, but without creating waste. Another popular coffee pod system is Nespresso. Nespresso pods, called capsules, are mostly non-recyclable. They do however, have a recycling program similar to the ones mentioned above. The only difference is that this program requires a little more effort on the part of the consumer. Instead of a mail-in system, Nespresso requires you to drop off your capsules at one of the specific drop-off locations. I don’t think I’ve ever met a person who claimed to not care about the environment. Similarly, I don’t think I’ve ever met a person who doesn’t consider convenience a top priority in their life. Unfortunately, the two rarely go hand in hand. People neglect recycling not because they don’t care but because “it’s too much work.” My mother doesn’t use a reusable bag at the grocery store not because she thinks they are stupid, but because she almost always forgets them at home. I use a Tassimo coffee machine, not because I hate the environment, but because it’s convenient. Creating a sustainable lifestyle takes a lot of work, but it doesn’t have to be impossible. There are a million little ways that will make a difference and hardly take up any time at all. If throwing my coffee pods into a cardboard box instead of the garbage and spending five extra minutes a month to drop it in a mailbox will make a difference, then why not do it? Either that, or learn how to use a coffee machine. Three tablespoons of coffee grounds for every pot of water; as it turns out, it isn’t that complicated after all.